The VDOT I-64 Express Lanes Segment 1 project includes the conversion of 8.4 miles of existing HOV (High Occupancy Vehicle) lanes on I-64 between the I-564 interchange and the I-264 interchange to express lanes. DAVENPORT served as a subconsultant for the Toll System and Services contract which includes design, integration, installation, testing, operation and maintenance of the toll system associated Segment 1. 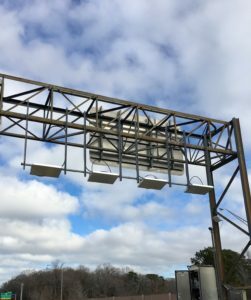 DAVENPORT’s role on the project included serving as the electrical engineer of record for all tolling equipment including all wiring and conduit diagrams to supply power to and communication between the various tolling equipment. In addition, DAVENPORT also provided maintenance of traffic plans for all on-site installation, testing, tuning and maintenance of the toll system.